Mindfindr ranks applicants according to suitability and describes their personality, competences, work style and leadership potential. Mindfindr facilitates recruiting throughout the process from pre-screening to interview planning and selection decisions. Mindfindr facilitates career planning, presenting the assessed person’s suitability for positions based on the personality, work style and competences. Mindfindr estimates the person-position fit of the assessed at all training levels. Mindfindr supports organizational development by lifting up unused personnel resources and pointing out competence gaps and challenges. Mindfindr enables rational team formation and helps in defining roles in executive boards. Mindfindr helps organizations acquire a deeper understanding of the potential, critical strengths and developable challenges of individuals and teams. Mindfindr saves time and cuts down the workload in recruitment processes by offering various optional assessment procedures applicable free of time and place constraints. Mindfindr produces multifaceted information useful for various HR purposes, with easy to use results accessible immediately upon completion of assessments. Mindfindr makes recruitment processes more efficient, facilitates personnel and career development and supports in team creation. Mindfindr is compatible with and complements other assessment tools and methods. 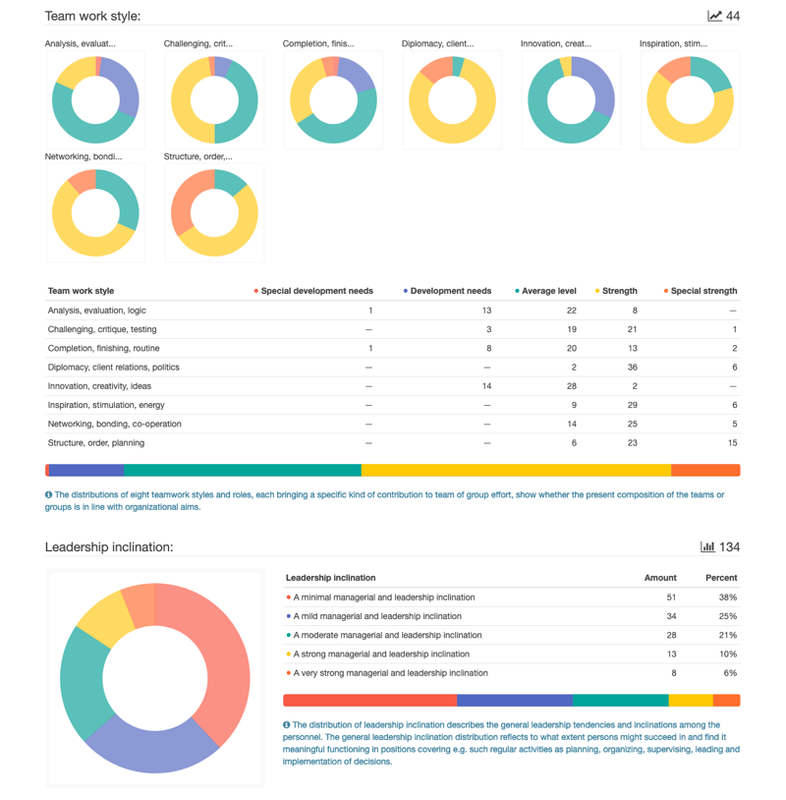 A Mindfindr profile covers descriptions of the personality, competences, leadership potential, leadership type, leadership style, work style, team roles and team work style of the assessed as well as an occupation and position specific list of his or her suitability for different positions. Start by choosing among the long occupation list the title of profession, occupation or position of interest so as to enable comparison of suitability scores among applicants or testees. For coaching or training purposes ranking may not always be necessary. Mindfindr dispatches the invites by email to specified participants. Alternatively Mindfindr account owner may invite participants using anonymous codes. Participant lists may also be produced from other data registers or information reservoirs of the organization to dispatch invites. Individual test results are available immediately upon the completion of the test by each test participant. The report includes e.g. a description of the personality and relative strengths in competences and skills of the testee besides the suitability score for a specified or any other profession OR occupation of interest. No setup charges, pay only for completed tests. €5 per participant, +€15 for an extended report (including work style, team work style and roles, leadership type and style). The Mindfindr Organization Development (OD)-report offers any organization a comprehensive outlook on the organization's human resource structure by providing concise yet substantially extensive information on relevant aspects of the personnel's characteristics in the organization. Clearly presented graphs and tables with practical concept definitions allow the management and HR professionals of an organization to command an overall picture of the organization's strengths and talent pools while enabling spotting potential challenges and competence gaps. The Mindfindr OD service facilitates analytical development and management of human resources regarding the personal strengths and competence structures, work and teamwork styles as well as leadership potential and leader types in the organization. Keep up with developments in Mindfindr with our newsletter.